Watford enjoys an enviable proximity to the UK’s transport network. Watford’s location just inside the M25 at junctions 19 and 20 and just off the M1 at junction 5 ensures it simply couldn’t be easier to get here. Access from the M40 can also be swift via junction 16 of the M25. London Heathrow and Luton Airports are 20 minutes away. There are a number of bus services running to Watford. Use www.intalink.org.uk to plan your journey. There are three stations in Watford. Watford station is serviced by the Metropolitan Line, Watford Junction station serviced by the Overground line and National Rail services via London Euston, and Watford High Street serviced by the Overground line. 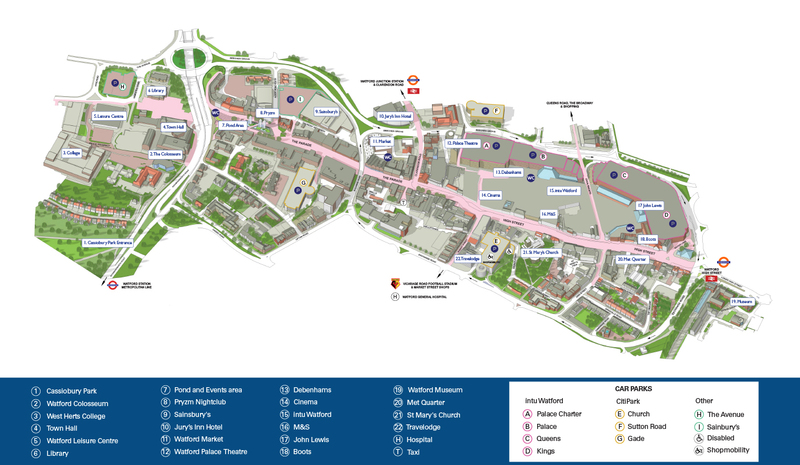 The tube is a good choice for those wishing to visit Cassiobury Park, Watford Junction is closest to the Clarendon Road business district and Watford High Street station brings Watford’s Intu Shopping Centre and retail parks within comfortable walking distance. Visit www.nationalrail.co.uk or www.tfl.gov.uk to plan your journey.